So, why am I reviewing a cheap, 11.5”, 2-in-1/convertable Android tablet from RCA? Well, one it’s a little test of whether it’s actually decent to type and do work on. So far, so good as writing this up on this was a breeze while I sat on the couch and watched TV. More importantly though, it’s a mean of expounding on something I sometimes forget and other times am in awe of: technology is now rather good even when cheap. I imagine other people sometimes forget that too, so maybe this little post might help other folks remember that even cheap tech is pretty good now. Is the fit, finish, performance of this as good as a 2-in-1 tablet even 40 dollars more, let alone an iPad or a Chromebook? Of course not. However, would this have been a better device that any of the netbooks I got through school on, let alone my first notebook PC I bought when I was in community college? By leagues in all but screen quality, and at $80 US, it’s so hilariously cheap that I can let it’s basic screen slide (besides, it has a mini HDMI port and screencast function, so I could always just hook it into a monitor if I really needed to.) It even manages to recognize peripherals like USB microphones and sound cards, and while it won’t run any cool 3D games, it still runs my favorite mobile DAW software, Caustic, without a hitch. 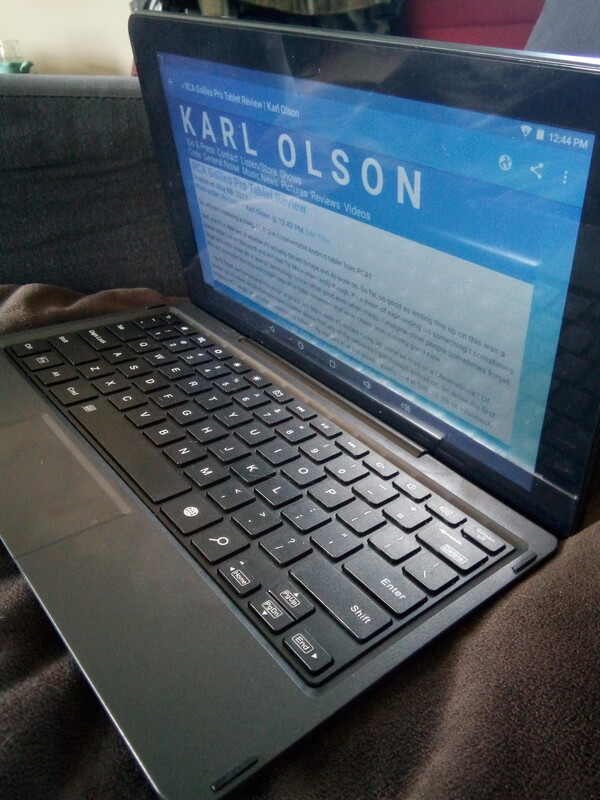 The keyboard isn’t the most luxurious, but it’s actually easier to use than my much better specced Surface Pro 1, and definitely better than trying to use 7-8” tablets with any OS to do some writing beyond a tweet. I think some activities on this would be a bit of a challenge due to a software gap (if there’s something as straightforward as Audacity that runs on Android, I’ve not found it, though I’ve not had the motivation to until now,) but the performance even on this cheap little 2 in 1 is just dandy. Streaming video, browsing the net, social media – all the usual to dos work just fine, and it’s nice to take a break from doing that on the phone without switching to the desktop (I get enough desktop computing at work 5 days a week.) It’s even decent machine to run remote desktop on, easily getting on my company’s VPN and into my Windows box at the office. The battery life is just average, but it’s the modern average of about 7 hours which clowns any of my old netbooks and my Surface Pro 1. It’s far from perfect, but, it really just doesn’t have to be perfect. It just has to do the jobs I need it too, and it’s happily achieving that. Plus, some of the stuff that I’m sure some people would hate about a lot end device like this – the 1990s styling and plastics – are actually kind of endearing and keep it from being a theft target as well. Still, the next time you think need to get the super latest and greatest thing to do what you need, take a minute to really think about the jobs you need to get done on that device, and what tools you already have and whether they’re already covering your bases. You might find that where you thought you needed to make a serious and expensive purchase, something less exciting might easily handle everything you wanted. If you’d like to pick up one for yourself, here’s a link: RCA Galileo Pro 11.5.